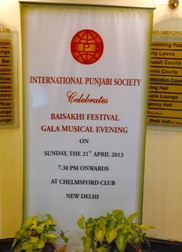 International Punjabi Society true to its objectives and ideals always worked steadfastly to promote activities by arranging innumerable welcomes and receptions for the visiting dignitaries and delegations. It encouraged and always promoted the Punjabi language, literature, culture, folklore, dance and drama by organizing cultural shows and events. 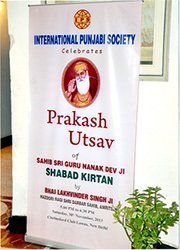 Every year ritual - the society celebrates its annual anniversary and convention at different centres in India and abroad alternatively. To make these functions successful and purposeful numerous delegates from overseas come to India to take active part in the much acclaimed celebrations and vice-versa. The enthusiasm generated at these get-together is seen to be believed. This encouragement is a great source of pride of all concerned. At annual conferences held regularly, the functions are graced and presided over by high dignitaries of the stature of head of the country, the Prime Minister, Hon'ble Ministers, Governors and Chief Ministers. The functions abroad are likewise inaugurated and visited by high dignitaries of the respective countries. Special seminars are arranged during the convention where renowned Punjabi scholars, intellectuals with their pearls of wisdom and brilliant ideas contribute towards the furtherance of punjabiat, brotherhood and enhancement of our rich culture.